Levi Shirley in collaboration with MAXXIS and Kraken RC are proud to introduce to you the KRAKEN VEKTA.5LSE PRO KIT. 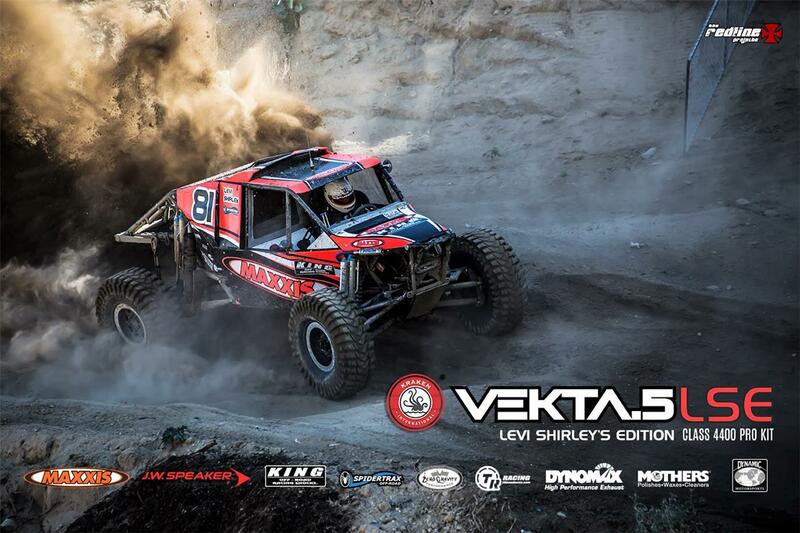 Experience the thrill in building and bringing to life this awesome 1/5th scale kit that resembles Levi Shirley's 1:1 Class 4400 rig named "Loretta" as seen in the King Of The Hammers circuit. 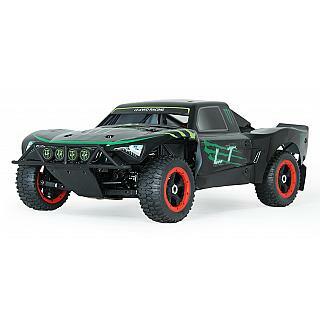 This Pro Kit comes with pre-cut clear body panels and pro livery wraps. Assembly required. The vision behind the KV5 is to create a new platform that is completely unique. We believe we have achieved our vision with the VEKTA.5. It is BIG and BOLD with only one word to describe it - “THE BEAST”! 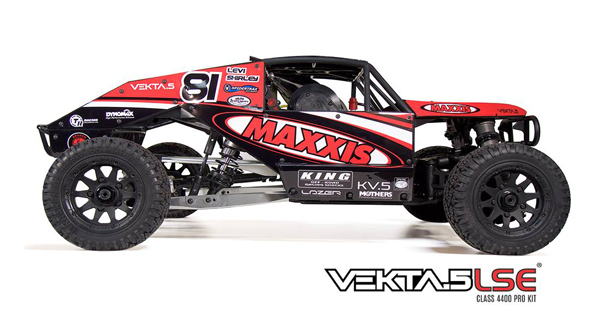 The KV5 is an Independent Front Suspension and Rear Solid Axle design that brings real-world fun and excitement to the 1/5th scale RC world. The KV5 uses an “open design” in which everything can be easily accessed and removed with minimal fuss. Installing an engine for example only takes a matter of minutes. We also understand that an RC is not an RC without exciting hop-ups. Therefore, during the development of the KV5, we reached out to companies like DDM and Turtle Racing to future-proof your investment. 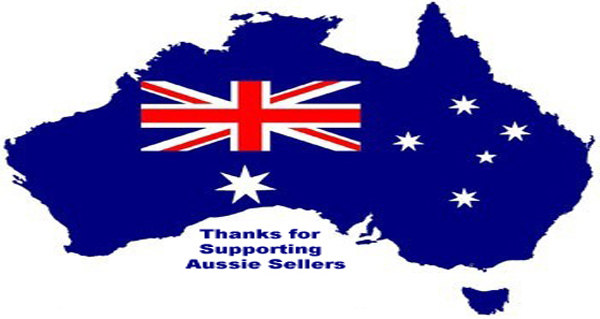 Please be on the look out for exciting after-market hop-ups coming from them. The Front section of the KV5 comprises of heavy duty nylon arms designed to absorb hard impacts. 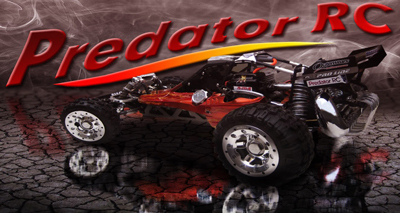 It is designed with Independent Front Suspensions and supported by our MEGA SHOCKS. Shocks are anchored on a massive 8mm thick CNC Shock Tower. The articulation of the A-Arms are supported by 8mm steel hinge pins. 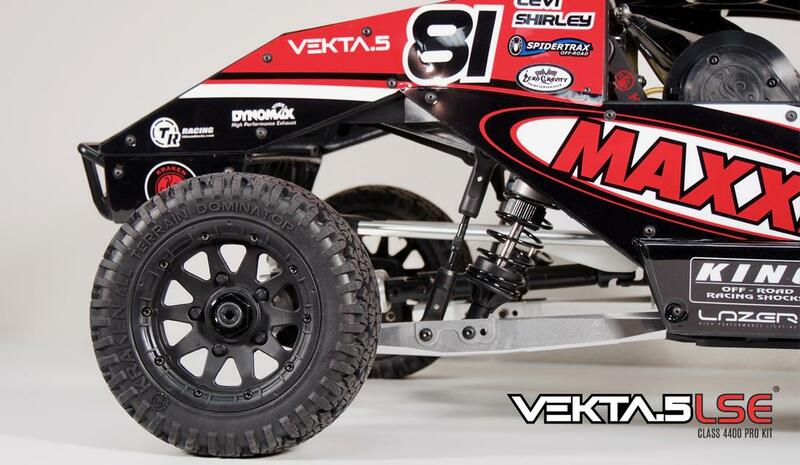 To absorb huge jumps, our MEGA SHOCKS are equipped with 38mm aluminum oil filled shock body and 8mm shock shafts. The front and rear drivelines are CVD based with 8mm drive shafts. An all metal differential is housed in a heavy duty Fiberglass Reinforced Nylon housing. The front arms allow camber adjustments for fine tuning. The main chassis is made out of a heavy duty 5mm aluminum plate. The front to mid section of the driveline is non CVD. This means that you can easily detach the entire front assembly with arms, shock towers, differentials etc. intact for quick maintenance or to replace the center dog bone quickly. The KV5 offers a unique plenum style air filter. It is essentially a filtered air chamber for an engine. There are many benefits to using a plenum style air filter. 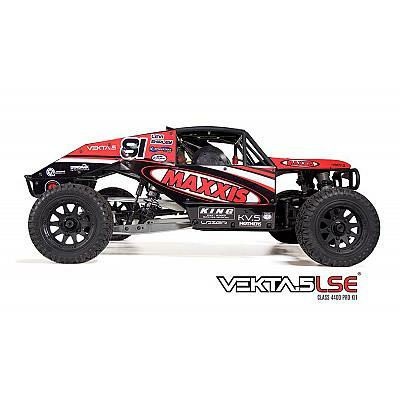 It enables the KV5 to achieve a slimmer chassis design. This design opens doors to other future body iterations for the KV5. 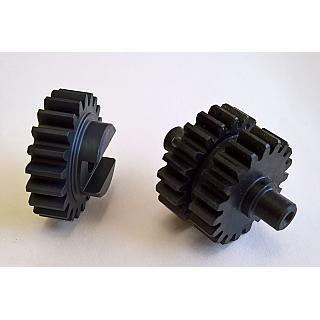 The center transmission comprises of CNC cut heavy duty steel Pinion, Step, and Spur Gears. As an added bonus, we have designed the Spur gear with an inclusion of an adjustable Slipper Clutch for protection to the driveline. You can also fine tune the clutch according to your driving conditions. The Slipper Clutch is easily adjustable with a M4 driver from the top of the transmission. The center transmission is supported by 2 aluminum plates enclosed by a removable Lexan shroud to protect the gears from dirt and grime. The rear section is a 4 link triangulation design with 2 - 12mm upper links bars that help center the monster Rear Solid Axle. The rear trailing arms are fully adjustable in height. When rock racing, the trailing arms can be adjusted up to 2 inches higher than it’s original stock position for better clearance . The monster rear axle and trailing arms are all CNC precision machined and are virtually indestructible. Toe-ins of the tires are adjustable simply by rotating the hub adapters at the ends of the Rear Solid Axle. The positions are visually marked and are referenced by a technical chart in the manual. 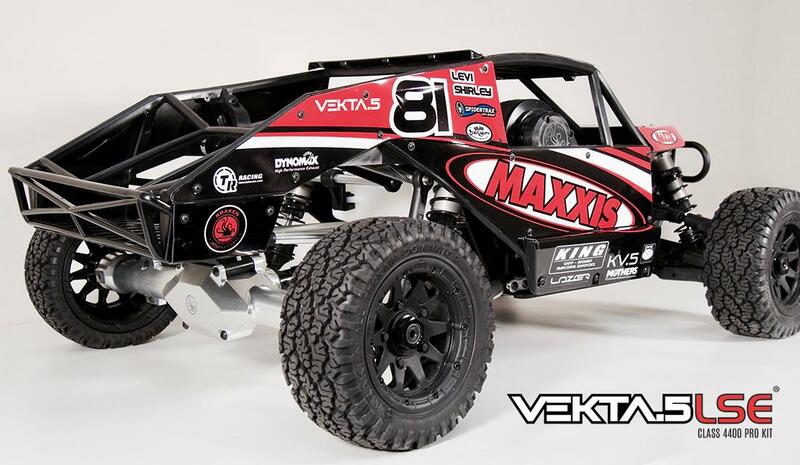 An all metal differential unit is housed in the rear solid axle and is enclosed with a CNC aluminum housing plate. The rear drive shaft design is of a telescoping style with U-Joints, similar to the 1:1 off road trucks. Splined Joint design enables you to detach the rear solid axle quickly from the main chassis by simply removing 5 screws from the RSA adapters. 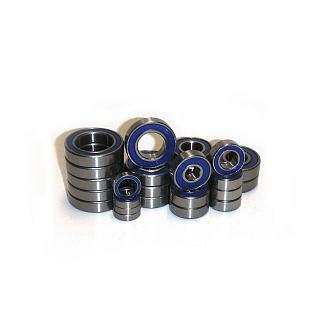 Just like what we have set out to do from the beginning, we want wrenching to be fun and easy. Two 5mm vertical aluminum plates uphold our MEGA SHOCKS. To put things into perspective, these shocks are a little shy of 12 inches in length (approx 300mm). They are BIG. The rear section is designed much like a roll cage; trussed with 5 - 10mm aluminum bars and it houses the fuel tank. Rear torsion levers and 4.5 mm sway bar finishes off the design of the rear. 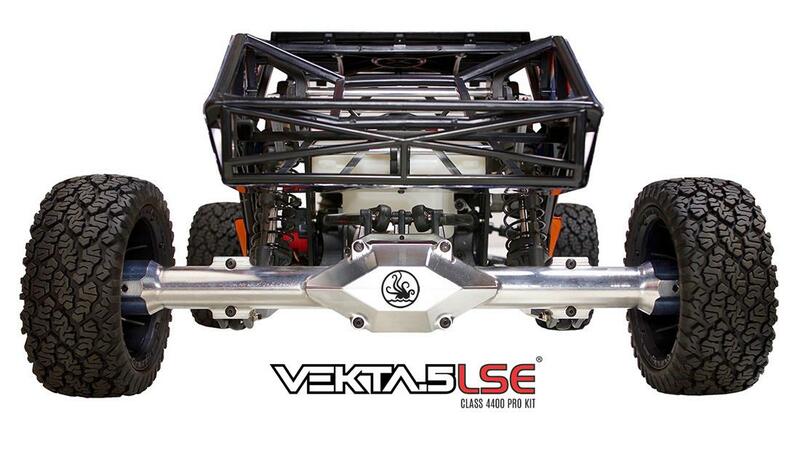 A massive one piece heavy duty roll cage encapsulates and protects the chassis and it’s internals. 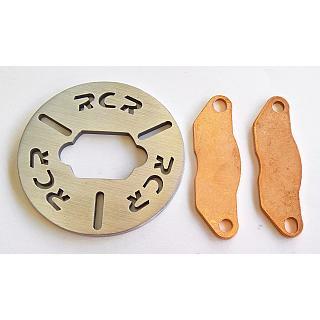 It is a one piece scale design and can be easily detached by removing 4 bolts and a pin. The KV5 ARTR is equipped with KRAKEN ATDs - “All Terrain Dominator”. These are aggressive, heavily threaded, multi-compound tires designed for long term wear and heavy duty bashing. They also provide great grip in any driving conditions. Wheel hexes are of the standard 24mm hex. After-Market wheel and tire options are bountiful should you decide to modify your rig at anytime. These are just some of the highlights of the KV5. It would be impossible for us to list them all. The best way to experience “THE BEAST” is to pick one up for yourself!